This lease is for office furniture and fixtures owned by the landlord leasing office space to the tenant. The furniture is located in the premises, and is detailed on an exhibit to the furniture lease. In some cases, tech companies such as hosting companies, software development companies, and data center operators, prefer to lease such furniture and fixtures instead of purchasing and depreciating them. 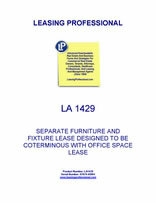 This form is a separate lease for the furniture, equipment and personal property in existing offices subleased by the original tenant to a subtenant. 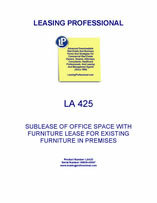 Subleases can be short in duration, and this gives the subtenant the convenience of leasing the furniture and equipment for the term of the sublease. Tech companies such as hosting companies, software development companies, and data center operators, often prefer this sort of arrangement. 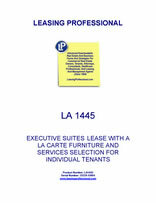 This form is drafted for a short term executive suites lease. The form provides for an a la carte selection of furniture and services needed by the tenant, with individual charges for each item.